There are many places we can visit in San Francisco and during the first day, we could actually get an action-packed experience. Many people start by taking the cable car to Pacific Heights, so they can gaze the ocean and city below. The famous Golden Gate looms below and this could give us an appreciation about the size of the city. 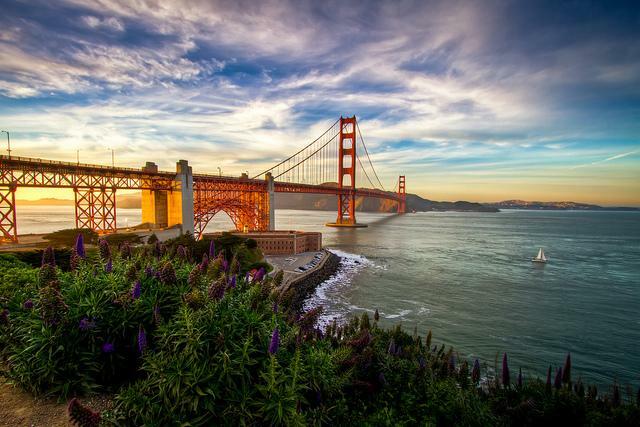 There are also other popular activities, such as taking the boat trip and sail under the Golden Gate and get closer to the infamous prison island of Alcatraz. The Fisherman’s Wharf is an excellent place for lunch or dinner, with its significant conglomeration of cafes and gist stores. The Chinatown is a popular attraction in San Francisco and it’s actually the biggest Chinese settlement outside the mainland Asia. The street is alive with colourful banners, intricate Chinese calligraphy, gift shops, herbs stores and restaurants. It should be noted that San Francisco is a big financial center, with many business headquarters and offices. There are also many tech companies in the nearby Silicon Valley; so we will see hoards of professionals hurried to work. Haigh Hasbury is a place for people to purchase old memorabilia and various souvenirs. Fort Mason is known for many excellent restaurants and we could get the glittering view of the magnificent Golden Gate at night. Visitors who want to experience San Francisco could get the general ambience of the city in the Fort Mason. At the outskirts of the city, we could visit the Muir Woods with some really magnificent redwoods and this will provide us with an understanding about the natural surroundings of the area. The San Francisco Bay area is highly urbanized, but if we travel further east, it is possible to find more natural environment. Another good restaurant in the city is the Equinox and it is essentially a revolving restaurant located at the highest floor of the Hyatt Hotel in the Market Street area. The restaurant provides us with a great vantage point to see the bay and city. It is also a great polace to look down upon the busy streets and survey the surrounding skyscrapers while sipping coffee and eating some chocolate fudge cake. San Francisco is certainly a marvellous city and travellers would always love exploring its buzzing, unique streets. The assortment of building is also admirable and we can browse many of the stylish stores. San Francisco is one of the most visited cities in the US, other than NYC, Los Angeles, Washington DC and Miami. It’s certainly a place well worth exploring many times over. San Francisco is located in California and just north of the greater Los Angeles area. California is a great place to visit and San Francisco could be a great place to conclude our visit in the state. The splendour of the Pacific coasts during the summertime can be magnificent further south, but people who want to experience cooler environment could go to San Francisco instead. Previous article How Travellers Should Prepare Their Trip?